The second series of the irresistible "EMPIRE" (E4) continues with the usual cross-and-double-cross in the Lyon family. It's soapier than ever, and is most definitely a 2010s successor to Dallas, only substituting the music business and the bling for the oil and the ten gallon hats. Larger-than-life characters, a cracking soundtrack (by Timbaland) and cliffhanger after cliffhanger. I seem to be the only person I know who watches this show; I just wonder what its ratings are over here. It deserves a massive audience. Even if you're not into the hip-hop music at the show's heart, it's unmissable viewing, and a rarity these days: a TV drama where the main characters are not only black, but black and successful. I haven't watched "THE BIGGEST LOSER" (Sky Living) in years, but as I've started a fitness regime I thought I'd watch this for some motivation. One of the contestants in this particular series was none other than Ruben Studdard, who won American Idol back in the day when I still lapped up every talent show going. 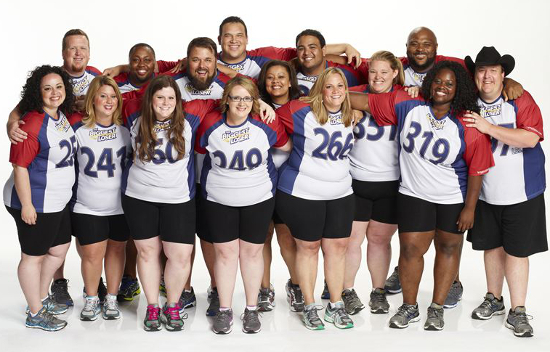 Being an American show, as the pounds come of, the sentimentality piles on. But for some reason I still enjoy it. Over on this side of the pond, "LOSE WEIGHT FOR LOVE" (BBC1) takes a new approach to weight loss - separating overweight couples to encourage them to lose weight. This show only began last week, but I feel that it could be a long runner, as it didn't just focus on the weight-loss stuff but also the underlying psychological issues and insecurities....for me, this was very close to home, and there was definitely something in my eye by the end of the first episode. I've just finished watching "THICKER THAN WATER" (More 4) a Swedish drama which started slowly but turned out to be very engaging indeed. This was a very different kind of "Nordic Noir": a family saga beautifully filmed in the surroundings of the Åland Islands, where three siblings were made to stay together to run their late mother's guest house as a condition of their inheritance. But they were to endure a number of troubles along the way. Faithful travelling companion introduced me to the second series of "INDIAN SUMMERS" (Channel 4). Now I missed the first series but quickly picked up on the characters and storylines. This drama, set in the Raj in India in the years prior to independence, was very expensive to make, and certainly looked the part. But it suffered from that modern TV curse - the ratings fall - but scheduled in that major ratings battleground of the Sunday night 9pm slot, then that was to be expected. And who watches live TV these days anyway? However, it could be argued that this show was killed by the critics, who continuously picked away at the plot lines. So there's not going to be a third series, which is a shame as I was just getting into it. It's May, which means that "CORONATION STREET" (ITV) will go into its annual big week of storylines, which also conveniently slots into the live week of Britain's Got Talent (flippin' eck, is that still going?). 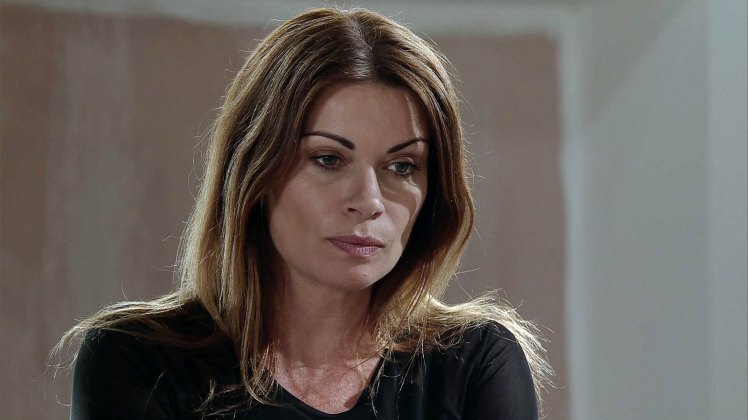 This time we can expect the discovery of Callum's body, and the lead-up to Carla's departure from Weatherfield. I will really miss Carla, my favourite Corrie character - I've loved Alison King since she was Lynda Block in "Dream Team" on Sky One. Aah, "Dream Team"....now that was appointment-to-view TV! I like cooking shows and I like travel shows, so when you combine the two then that's a must for the TV planner. "PAUL HOLLYWOOD'S CITY BAKES" (Food Network) took the Bake Off judge to various locations, including Warsaw, Copenhagen and our most recent destination, Madrid (above) - and for a change, he was in more favourable mood and didn't need to criticise the cakes. It's good to see "TONIGHT AT THE LONDON PALLADIUM" (ITV) back on our screens again. 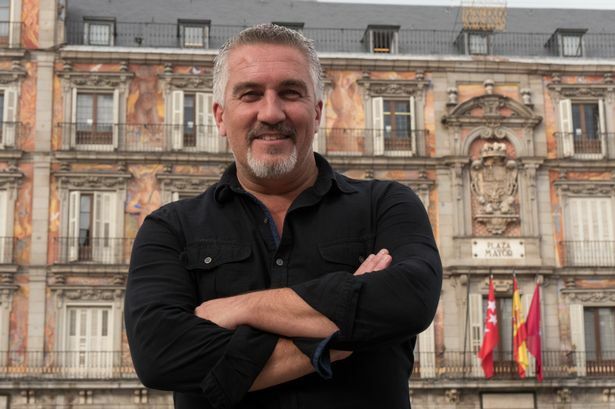 There's been a change since the last series: it's moved from Sunday night to Wednesday night and has one main host, rather than different guest hosts. Good news: the main host is the wonderful Bradley Walsh, who is currently my favourite presenter on British TV. He is so natural, funny and entertaining, and makes "The Chase" the best quiz show on our screens. 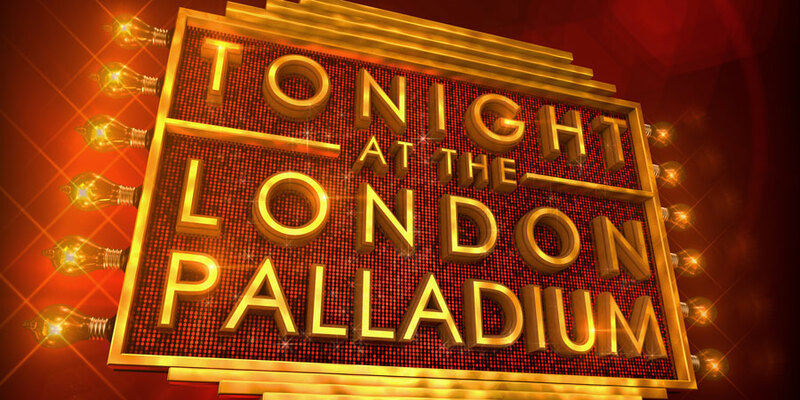 ITV being ITV though, they've got to fit in Peter Andre somewhere with a Palladium running gag. And it's a good idea to record this and watch on fast-forward during the Joe Pasquale "release the squeak" segment. 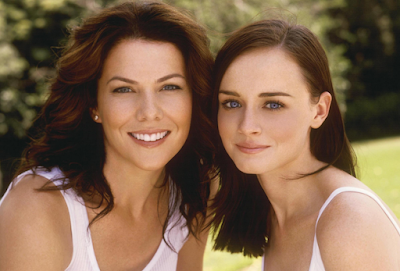 Another old favourite of mine, "Gilmore Girls" is also coming back with a limited series of four feature-length episodes. It will be screened at some point on Netflix. Now I don't have Netflix. But the thought of a Lorelei and Rory return means I might just have to sign up! So, Eurovision is over (reviews to follow over the next couple of weeks) and we are now heading into the summer months, so that will be a good opportunity for me to finally catch up on some of my massive TV backlog. And then we have Euro 2016 and the Tour de France, and the Olympics, and the Vuelta, and ......oh well, I'll have plenty to watch! Square-Eyed will be back at the end of July. Hi guys....once again I've fallen behind with all my blog posts so my 2 semi-final posts will be written up and published, along with my review of the final, hopefully - time permitting - within the next couple of weeks (and not 4 months later, like in 2015). I'll make sure I don't lose my written notes this time! Well, although I haven't really been into many of the songs this year, on the other hand I don't actively dislike any songs in this year's final either. Many of them just leave me with that 'meh' feeling but who knows, I might look back in future years with rose-coloured glasses and think '2016 was actually quite a good Eurovision year'. Stranger things have happened. I really ended up enjoying both semi-finals. 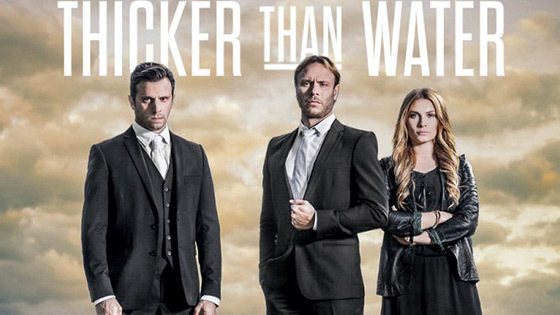 SVT have once again given us a very slick production whilst Måns and Petra are a good combination; a massive improvement on last year's dull trio of presenters, not to mention the screaming presentation duos of the mid to late 2000s. I'm sure that M & P will do a great job in the final, with lots of humour guaranteed. There is also the small matter of a big, big change to the voting. This new format - which I guess is very similar to that used in Melodifestivalen? - should bring some much-needed excitement and will keep us on the edge of our seats until the last minute, rather than knowing who's won with several countries still to announce. That's assuming we don't have such a runaway winner that the end-section will be irrelevant of course. We are also promised something very different tonight - an appearance from none other than Justin Timberlake (above), performing his new song. Now, firstly, can I say that I've always been a big JT fan, but I don't really appreciate ESC being used as a vehicle to plug his music. So there may be the tenuous link with Swedish songwriters, but I would have preferred a Swedish artist (or selection of artists) to showcase their talent - thinking back to Darin and Agnes in 2013's semi-final for example. ESC may be constantly looking to the future and innovating year on year, but the inclusion of an American act, along with the contest being broadcast by a US TV network for the first time, suggests that there may be more afoot.....are we looking at the USA's eventual participation in ESC? The contest is also being screened in China, so who knows what may happen next. To be honest, I wouldn't want ESC to expand any further and go down that 'globalisation' route, and further diluting the European aspect of the contest. Maybe the various continents/regions of the world could establish their own equivalent song contests, with, say, the top 4 songs from each contest then going on to compete in a "World Cup" song contest event along with the top 4 of ESC. I believe there are plans for an Asia-Pacific version of ESC and I'll be very interested to see how that goes. Which inevitably brings me to the elephant in the room.....there has been a bit of criticism lately regarding Australia's participation in ESC; much of this is from people who haven't bothered to research the reasons why they are in the contest. By this stage I'm quite ambivalent about it - I'm happy to see such a genuinely Eurovision-loving country get an opportunity to compete, but I can't really see them sticking around in the longer term, especially if an Asia-Pacific version of ESC becomes a reality. What cannot be disputed is that in just two years of competing, Australia have raised the bar for professionalism and credibility. Guy Sebastian was excellent last year - I still love "Tonight Again" and although I'm not a particular fan of "Sound of Silence", Dami Im gave a faultless vocal performance worthy of an international superstar. By sending hugely talented, experienced and professional performers with strong songs, Australia in just two years have cracked the formula for Eurovision success and acclaim, which the UK can only watch and envy. Tonight Joe and Jake, two agreeable young lads who formed a duo after competing individually in "The Voice" (which now seems to be a breeding ground for many a Eurovision contestant from various countries) will be representing the United Kingdom with "You're Not Alone". 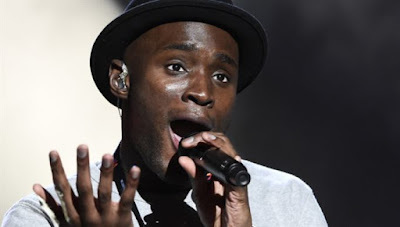 This song won the rather half-hearted UK final - although I suppose we should be grateful that the BBC even ran to a national final at all - and as Simon Cowell would say, "do you know something?" I think this is the UK's best entry for a long time, and it deserves a place on the left hand of the scoreboard for a change. I'm proud of this as a UK entry - it's contemporary enough and you remember it after just one hearing. The guys sing well and do the best with the material and staging that they are given. Come on Europe - vote for us! We don't all want "Brexit" despite the media's obsession - and in the words of this song "we're in this together"! In an interview during the BBC4 semi-final coverage I think it was Jake who said that they wanted to change the perception of the contest in the UK. However, given the UK mainstream media continuously perpetuating wildly inaccurate stereotypes and ideas about the contest, that will be an uphill struggle. By the way, I was thrilled to get 10 out of 10 qualifiers from semi-final 2. Don't think I've ever had a 10 out of 10 before....just wish I'd put bets on! So, on to my predictions for the final. Being a year-round ESC fan, it is very easy to get swept up in the hysteria generated by bloggers, tweeters, superfans etc about certain songs. However, the majority of the ESC viewing audience will (a) only watch the final and probably don't even know about the semi-finals and (b) be completely oblivious to months of gossip and speculation in the fan world. So, putting myself into the shoes of a "casual viewer" it would be impossible (or is that impaa-see-baal, eh Dima?) to see past a Russian win. Viewers will be blown away by the technical excellence of the staging, just like last year's winner. Unlike many superfans and bloggers, the casual viewer won't be debating with themselves that the song is too "old fashioned"/reminds them of Sakis Rouvas etc etc.....they will just be impressed by the whole spectacular "show". And I wouldn't mind Sergey winning, because he is a good pop star, and he takes me back to the good old "Sounds of Europe" days when Rachel and Keira introduced me to his music. On the other hand, maybe the problem with the staging of "You Are The Only One" is that it's just too cold, too clinical, too calculating? 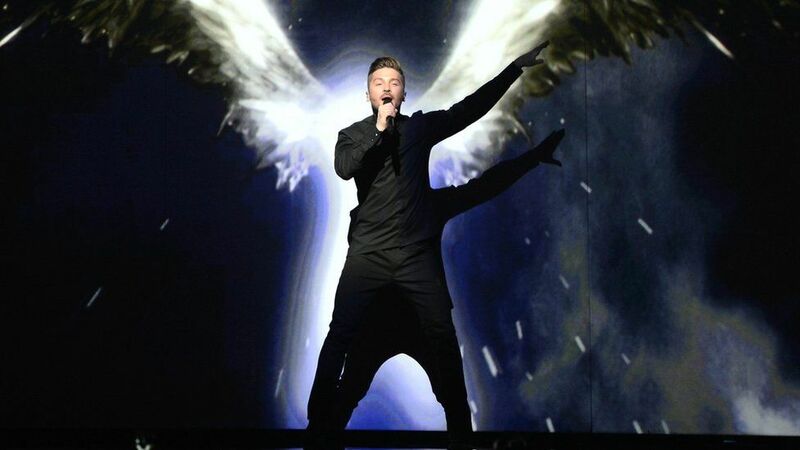 Sergey didn't really need all that over-the-top staging - he's good enough without it. Then there are the wider implications of Russia hosting the contest again, given the specific issues around, let's just say, gender politics. But Eurovision's not all about the big show or the big voices, so I still predict Sweden and Italy as top 5 contenders. The "less is more" nature of their entries will contrast the bombastic staging or vocal performances of the top 3 favourites. There was so much hate for Frans after he won Melfest; but to a viewing public who have never heard of Melfest or schlager, they will 'get' his song and he will tap into the Justin Bieber/Ed Sheeran fandom. And there are a lot of them. As for Italy, it took a long time for "No Degree of Separation" to register with me, but the staging is unusual and very sweet, I think Francesca's natural low-key charm will appeal to viewers and there is also a lot of love for Italian-language songs in Europe. All of this will add up to a successful final placing. Another one to keep an eye on is Austria's "Loin d'ici" sung by Zoe. I'd originally written this off as too sickly-sweet but it all made sense in the semi-final. In a time when native language at Eurovision is an endangered species, we have to support the only fully native-language song, which comes from a country which doesn't even speak that language! I think even Alanis Morissette would be impressed by that level of irony. What about my own favourites? Well, I'm still cheering for Justs but I can't see "Heartbeat" winning now, for some reason. I'm also pretty gutted that the draw has killed the Netherlands' chances - as has that embarrassing 10 second pause - because I really thought at one time that "Slow Down" could win the whole contest. I still think Serbia is underrated too; when I heard "Goodbye" for the first time it gave me "winner-chills". As for France, it's one of the few accessible, catchy pop songs in the contest but the staging of the song seems to have rolled back its chances of winning. Got 7 out of 10 the other night. I'll write more about the semi-finals over the next few days but in the meantime, here are my predictions for tonight's qualifiers. Yes it's that wonderful time at last....tonight sees the first of this year's ESC Semi-finals and it actually looks a tougher one to call than I first thought. So here are my foolish predictions of who will qualify tonight. In no particular order. Although you should never write off Greece. (Even with a duff song and that 2nd slot of death) in which case either Austria or Estonia should be afraid. Editorial: What happened to my Eurovision Song Contest? An older fan's view. there will be some constructive criticism ahead. My life as an ESC fan. Firstly, before you all rush to complain, let me explain something. I have been a massive fan of the Eurovision Song Contest for over 40 years now. I couldn't imagine life without it; what was once a one-night event transformed into an year-round obsession. Months of national finals and selections, followed by the contest itself, followed by the analysis, followed by that thing called Post-Eurovision Depression (PED) - let me tell you, it does exist! - and then it starts all over again. If anyone around me dares to criticise the Eurovision Song Contest, I will immediately put them right. I will tell them that the contest has changed, it is a modern, relevant television event with commercial and credible songs which people actually like enough to download - even here in the ESC-phobic UK! The Eurovision Song Contest is constantly evolving. The 61st contest is just days away. But if I'm honest, the contest has lost its identity somewhere along the way. It's not just ESC itself either: national finals season in 2016 did not hold its usual appeal for me. Granted, I had a number of other distractions going on at the time, but the overwhelming feeling was just disappointment. Where were all the great/catchy/distinctive songs? Where were those "wow!" moments? Week after week brought so many songs which weren't great, weren't bad, but just....there. I usually take a large number of songs from national finals and continue to play them long after ESC season is over; but there are very few songs standing out from 2016 season, and even some of those took a long time to grow on me. Perhaps all that is a reflection of what, for me, is now the main thing which is wrong with the Eurovision Song Contest. There's too much emphasis on the vision, rather than the song. After last year's contest, I wrote a post stating that although I preferred "Grande Amore" to "Heroes", I thought "Heroes" was the right winner for the modern-day contest - a contemporary song, with a dazzling and memorable visual presentation. As in every ESC, the following year's songs/staging/presentation are inevitably influenced by the previous year's winner. So following Conchita's big ballad win, a barrage of ballads were inflicted on us. After Måns' victory last year it was inevitable that a number of entries would follow in his wake and focus (more than is necessary) on the visual impact. This year, the visual gimmicks are being taken to a whole new level. Just as I predicted. It's not a new thing: the visuals have always been important at ESC, but I would argue that the visual aspect now seems to be the main focus of ESC, to the detriment of the songs. Yet there would be no ESC without songs! Gimmicks are nothing new. There have always been daft gimmicks, unusual clothes, quirky dance routines. But nowadays, it's taken to a whole new and often ridiculous level, as each country looks for new and challenging ways to impress the viewing public. However, one person's visually dynamic presentation is another person's sensory overload. Sometimes you reach the point where enough is enough, and channelling Father Ted for a moment, you're thinking "just sing the f*****g song" and to hell with the flashing lights, the visual effects, the dress projections, the holograms, the irritating backdrops, the interpretive contemporary dance....etc etc. And then, there are the clothes. An outfit can make or break your chances of qualifying. Looking at some ridiculous outfits from this year's rehearsal clips, I just wonder if these these people have learned nothing from Moje 3? Or are they perhaps more interested in a Barbara Dex award than a place in the final? Bad styling has always been a 'thing' in ESC but with such a strong focus on the visuals in today's contest, "what were they thinking??" is a phrase which increasingly comes to mind. A dress/suit/outfit should complement your performance, not distract from it. The modern-day ESC is a triumph of slick production and technical excellence, and the visual effects, styling and overall package play a crucial part in where a song will end up on that scoreboard. (So I guess if you can't beat them, join them ..... I've even overhauled my grumpy old method of marking ESC entries and will introduce a new marking system this year to reflect other aspects apart from the song). However I can't help but hark back to the "old" Eurovision when you had an actual stage set, with only minimal movement, and the most "visual effects" which you could expect were subtle changes in lighting. 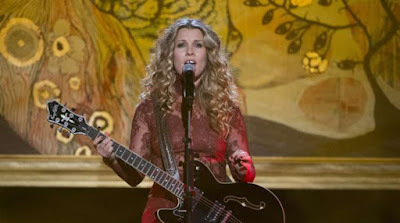 The main focus was on the song, and the vocal performance of it. There was little opportunity to enhance the song, unless you threw in a few props or a daft little dance routine. And that was that. Change is necessary. Everything has to evolve to survive. ESC wouldn't have made it to 60 years without those vital changes. And I certainly wouldn't want the contest to go back to the days of the type of invited audiences who were, in the words of the late great John Lennon, "rattling their jewellery". That was the most significant, and positive change, in the contest's evolution; allowing the fans to attend gave the contest a terrific new dynamic. 3: The abolition of compulsory native language. 4: The abolition of the orchestra in favour of backing tracks. I am very positive about the first two aspects - the internet gave ESC a whole new lease of life and turned the contest into a year-round event. (On a personal note, it also introduced me to lots of wonderful people who share my ESC obsession). As for televoting, despite the usual criticisms/allegations, I just love the idea of being able to vote for my favourite song(s) every year. There will be big changes to the voting this year, yet again, but televoting will never be abolished. Like the internet, it is an interactive and inclusive aspect which keeps the contest alive. Contrast that with a trend over the same period in Sweden, where a number of artists, from the most commercial and popular to the obscure and alternative, have elected to record songs in their native language and enjoyed great success as a result. If Sweden was not so focused on winning again and rushing to topple Ireland as all-time ESC champions, I just wish they would have the balls to send a native-language entry. Dream on, huh? One other very irritating thing has arisen in recent years across national finals and ESC - the number of songs by songwriters from other countries who submit numerous songs to different competitions. The same names keep popping up, year after year, all across the continent during national finals season. And when it comes to ESC itself, the "bought-in" syndrome is very evident. The best-known example of this is Azerbaijan. Their debut entry from 2008, "Day After Day" may not have been to everyone's taste, but crucially, it was a 100% home-grown songwriting product. Since that time, Swedish songwriters have provided the Aze entry every year. Whilst that suggests a clear hunger to win, it's also a slap in the face to that country's domestic songwriters. It would never happen but I would love to see more native-language songs at ESC. Perhaps a system could be introduced where countries would have to send a song in their own language every second year? Or perhaps more controversially, a points incentive where countries would be rewarded for sending native-language entries and therefore give them more chance to qualify from the semi-finals? But like I said, that will never happen! So the orchestra will never come back, I know that. Like Monaco and Luxembourg at ESC, it belongs to another generation. But I would like to suggest that all artists competing in a particular year's ESC could be given the opportunity to re-record their song with an orchestral backing track and choose whether to use this version or the usual studio version. I acknowledge that there are many songs which do not benefit from the addition of an orchestra, but there are many others which would be completely transformed and enhanced by the orchestral backing track,. I would also change the rules on songwriters. Abolish the current system and instead, songwriters must be a native of the country for whom they are writing a song. This could encourage and motivate "local" songwriters to up their game and submit quality songs rather than being overlooked in favour of all the usual international songwriting suspects. I'd also change the rules in national finals whereby each songwriter or songwriting team is only allowed to submit one entry to their national contest each year. In my recent Eurovision Memories post on the 1985 contest, I noted that the songwriters were featured in the postcards. Eurovision used to be a songwriters' contest - they got the trophy, rather than the artist singing their song - and perhaps a rule change like the one suggested above would give songwriters from all over Europe an incentive to raise their profiles in the contest. Can you feel the fan power coming your way? In the modern-day Eurovision Song Contest, the fan power cannot be underestimated. Thanks to social media, songs can be chosen in national finals and then dumped in favour of something else as a result of fan power. This year that resulted in Malta's song being replaced, whilst San Marino got a disco remix. I'm delighted that Eurovision is picking up a new generation of young fans which will hopefully ensure the contest's popularity for many, many years to come. I just wonder if all those from the fan community who fill social media with all that "YAAS SLAY QUEEN SLAY!!" nonsense (I guess I'm just too old for this game!) will stick around in years to come or will they move onto the next passing fad? However, Eurovision is not a passing fad - it's for life. And it inspires insane levels of loyalty and devotion. Social media, which has fuelled ESC fandom like nothing else, also breeds insane levels of intolerance, and the dark side of this came to the fore on two occasions this year; following the shock result in Poland, where fan fave (and potential ESC winner in their eyes) Margaret didn't win, the resulting furore and many of the comments afterwards made me feel quite ashamed to be part of the fan community. Ditto Frans' win in Sweden. Being a Eurovision fan is a privilege and it also brings responsibility. We are not just fans, we are ambassadors for our often-criticised event. We need to stick together, and I'm saddened if the future of our fandom is going to be characterised by the "haters" turning against their fellow ESC fans, just because we like, or don't like, a song or a country it is representing. Everyone is entitled to their own opinion and should be allowed to express it. But I also want to highlight the positive side of social media. I have many good friends on Twitter who share my love of ESC. Whether they are tweeting from the host city or from home, they all bring the contest alive every year and have given it such a special dimension for me. The best thing about following Eurovision, and all the national finals prior to it, is that it has always provided us with an opportunity to discover new music, new artists, and a welcome alternative to the increasingly tedious chart fodder of the 21st century. The Eurovision Song Contest in recent years has become so risk-averse and safe, with very, very few exceptions to that rule. My main criticism of 2016 national finals season was that so many songs were so generic, lacking any specific national characteristics, or were "inspired by..." other songs from the past year's Top 40 rather than trying to offer something original, quirky, alternative or what is increasingly becoming an endangered species at ESC - a catchy, melodic pop song which you can sing along with and remember after just one hearing. That was once the criteria for an uptempo ESC contender. This year's template appears to be the mid-tempo ballad - Sia's "Chandelier". Now I have a big problem with this, because I really can't stand that song at all. Even now, it still enjoys heavy rotation on radio, and where would a million talent shows be without it? That song leaves me cold. And so do all the songs in this year's competition which are inspired by it. A great ballad should give you chills, not leave you cold. Take a look at any top 40 chart in Europe. Pop music these days has been redefined. You'll find the usual EDM, tropical house, r'n'b, rap, and all the same old generic mush masquerading as pop music. But pure pop music, in the way I define it, is missing. Anything which is catchy, even "cheesy", with a memorable chorus you can sing along with, is described as "dated". I've heard that description this year and in previous years about some ESC entries. Well, give me "dated" any day. I previously complained that the "melodi" had gone out of the Melodifestivalen songs, well I guess the same could be said for ESC. And before you ask, I'm not advocating the return of schlager but a few more good tunes would be nice. A couple of years ago, whilst watching ESC with me, my late mum was complaining about how the fun had gone out of the contest, and how it had become very serious. At that point I became all indignant and went on about how the songs need to be more credible, how we couldn't go back to the boom-bang-a-ding-a-dong nonsense which many people in this country still associate the contest with. On the plus side, ESC is now free of all those silly/novelty songs; but a little bit of enjoyment in songs or performances wouldn't go amiss. There is a lot of pretentiousness in ESC now. Last year's ballads, and this year's "Chandelier"-a-likes mean that the fun factor is at an all-time low So whatever you think of him, give thanks for Serhat this year, and raise a smile when he sings that line which we all know as "I got to pee inside your mind..."
But joking aside, a bit of enjoyment wouldn't go amiss. Yes, modern Eurovision is a very serious business, but apart from the ballads, a number of songs are clinically, cynically manufactured to win at all costs; they try too hard and lack any natural charm. In previous years on this blog I have highlighted the importance of the need to "connect" with the viewers; something which is often missed out in the rush to technical excellence. Get that connection right and the votes are guaranteed. Let's get back to the songs. Just getting my rankings down here before the rehearsals start and then it will probably all change! Normally on Melodifestivalen final night I would be at home, laptop connected to the telly, but 2016 was different. I was on a weekend break to London with faithful travelling companion, only managing to catch the first few songs on my tablet before we headed out to dinner. I would catch up with the final later though. Despite my disappointment at the standard of songs in Melfest this year, and the trend towards generic radio hits, I guess it must be said that most of the songs in the final deserved to be there. But did the presenters? During this year's heats Gina Dirawi had a different co-presenter every week, as a nod to the past (15 years of the current Melfest format); for the final, her co-presenter was bringing things right up to date. William Spetz is one of those modern-day bloggers/YouTube celebrities; we have a lot of them over here too, but I can't say how good they are as I'm way out of that demographic. Anyway, young Mr Spetz was just a little too plastic for me but he did ok I guess. Thankfully no musical numbers to open the show - just a theatrical reading by Stina Ekblad - and a surprisingly short opening; only 10 minutes! The postcards featured the various artists having a look round Friends Arena. By the way, I really liked the backing music to the postcards this year. They have become a tighter and more professional outfit since their first appearance in Melodifestivalen, with snappy choreography adding to their usual goofy dancing around. I know a lot of the fan community don't like Panetoz but they do bring a much-needed feelgood factor and they absolutely deserved their place in the final. 2. "My Heart Wants Me Dead" - Lisa Ajax. Toilet rolls and too-short dress aside, this song had definitely grown on me since its heat and since that time it has booked a place in my annual top 50 chart. Of course it has a great similarity to Zara Larsson, but that can only have been a good thing, such is young Ms Larsson's growing worldwide popularity. 3. "We Are Your Tomorrow" - David Lindgren. Unfortunately the title of this calls to mind a cringeworthy charity song, and the best bit about it is him farting around with lasers in the first minute of the song. No offence to David, he sings and dances well, but he never really presents a strong enough case to represent Sweden at Eurovision. Petra Marklund lookalike Sara brought life and exuberance to this year's contest and 9th place in the final wasn't too bad for an unknown debutant. And it had a key change, what more does a Melfest song need? Kizunguzungu was infectious, and fun. 5. "Human" - Oscar Zia. Oscar co-wrote this with highly rated duo Smith and Thell. He's a very attractive young man (I think my mum would have liked him) who came out prior to the contest and said that this was a very personal song for him. 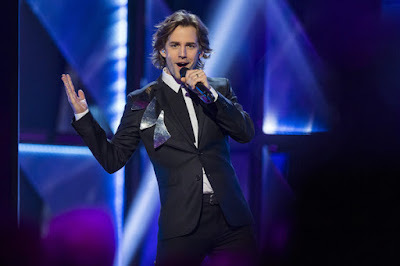 He would go on to win the international jury vote (although not for the first time in Melfest, that was eventually overruled by the televote) and you can see why; the song's dramatic staging and sharp camera angles recalled a music video and seemed to capture the spirit of a modern-day song contest which is about more than just a song. 6. "Don't Worry" - Ace Wilder. This is another song which fits the modern-day Eurovision template - if it's no longer about the song, but about the whole visual package, then this was definitely the finished article. From the twirling light-boxes to the fabulous choreography of her backing dancers, every Swedish Eurovision box was ticked. And what Ace lacks in vocal power she sure as hell makes up in charisma. 7. 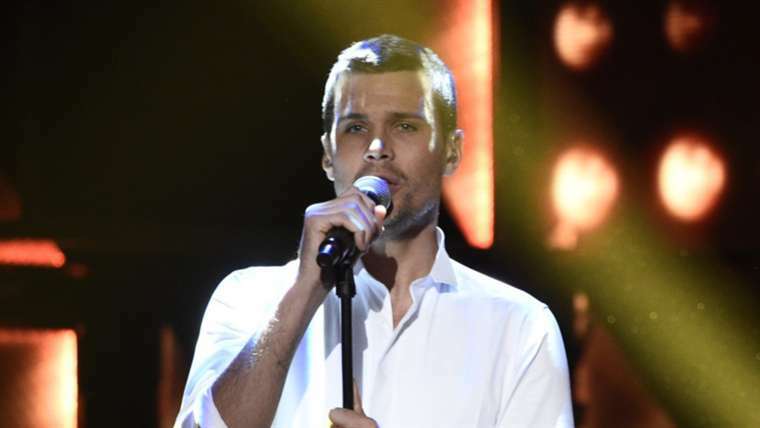 "Constellation Prize" - Robin Bengtsson. 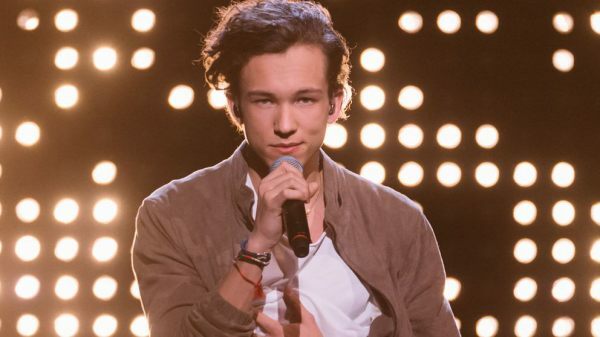 Like fellow finalist Lisa Ajax, Robin is yet another artist who got his big break on Swedish Idol. And once I got over my initial annoyance at the stupid song title and the similarity between this song and "Stole The Show", I actually began to really like this song a lot, and of all this year's finalists I would hope that he really gets a meaningful career out of this. My favourite song of the night. And on a completely shallow note, who could resist those piercing eyes...? 8. "Youniverse" - Molly Sandén. My main gripe with this song is the stupid spelling of its title. Otherwise Molly gave an excellent vocal performance - I still think and hope she will represent Sweden some day, but hopefully with something less overblown and contrived than this. Although I have to say that the ending of the song is excellent, chills-down-the-spine stuff. 9. "Put Your Love On Me" - Boris René. Boris is a kind of Bruno Mars/Olly Murs hybrid, with the commercial appeal of both artists, but also with the appealing underdog-vibe. His day job is football, rather than singing, and anyone who sings "you got my heart in a litter box" (well it sounds like that anyway) just makes me smile. 10. "If I Were Sorry" - Frans. This is introduced with a reminder of that awful Zlatan song. But Frans is now 17 years old and this is his big break at an 'adult' pop career. "If I Were Sorry" is the anti-"Heroes" with minimal staging and the corniest cockney accent since Lena - although he did actually live in England for a while so it's more authentic I guess - and it's everything which a Swedish Eurovision entry shouldn't be. Not a wind machine in sight. It's a Eurovision song as sorry-not-sorry hashtag, and he's also tapping into the whole demographic of the Ed Sheerans and the Justin Biebers and the less-is-more acoustic trend. It's more Kedvesem than Euphoria/Undo/Heroes. Do I like it? Well...yes, in a way, because there is something natural and unforced about it; and in a year of national finals/selections dominated by Sia wannabes, this turns out to be a very welcome distraction. 11. "Save Me" - Wiktoria. Where Frans was the lowest of the low-key, Wiktoria Johansson was just trying too hard, suffering from that over-singing disease which blights every talent show going. "Save Me" managed to tap into the country-pop trend which had been popular over the last couple of years, but left me cold. 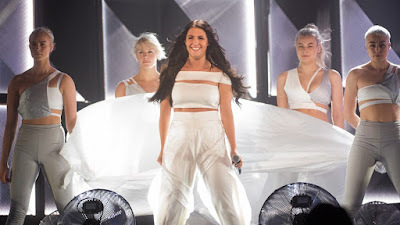 I could see her back at Melodifestivalen again, if not next year then definitely the year after. 12. "Bada Nakna" - Samir and Viktor. In 2016, SVT finally got the message that we're fed up with all the Kempe songs every year as he only had one - yes, only ONE! - song in Melfest 2016. It's this one. Samir and Viktor are of course the perfect modern example of fame-over-talent and their vocal ability (or lack of it) seemed more exposed here than on "Groupie". It wasn't the only thing being exposed though, as S and V targeted all kinds of demographics and took their tops off. For some reason this reminds me of a song which a national football team would record for a tournament such as the Euros or the World Cup!?! So, songs over, it was interval act time. After Jonas Gardell's "schlagerskolan" it was time for last year's Melfest winner - who also went on to win Eurovision - and a reinvented version of "Heroes", slowed down and with children in place of the little balloon-men. I'm guessing that we'll get something similar at Eurovision. With Måns having done his thing, it was time for the international jury votes. Well, where would we be without a bit of Klitos Klitou (!) and also the fabulous Maja Keuc who speaks brilliant Swedish! By the end of the international jury vote, Oscar, Frans and Ace were top 3. Whilst the televotes were being counted it was time for a medley of some of Melodifestivalen's greatest hits of the past 15 years, including Mendez, the Brandsta City Slackers, Timoteij, Mariette, Linus Svenning, Sarah Dawn Finer (who is looking great these days! ), Magnus Carlsson, Caroline af Ugglas, Andreas Johnson, Nanne Grönvall, Anton Ewald, Kikki and Bettan, Charlotte Perrelli, After Dark. With our memories jogged it was time to go back to the present for the televoting results. What immediately struck me was the closeness of the vote. Frans won with only 68 points rather than the usual over 100 expected of a winner. 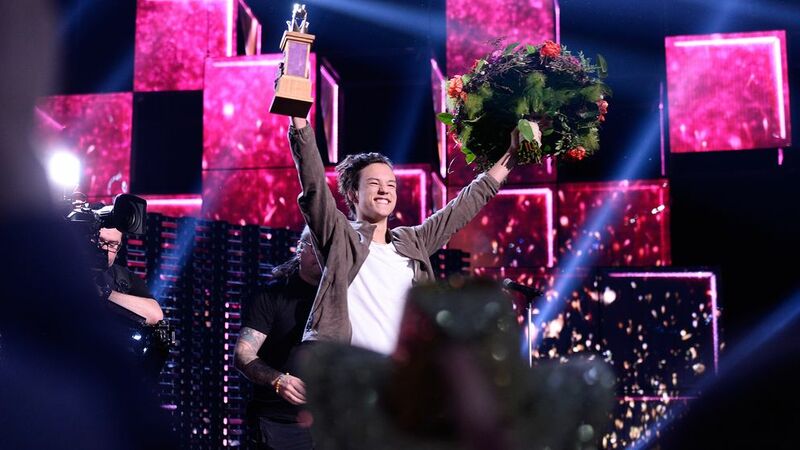 He's the youngest winner of Melodifestivalen since Carola - but only 14% of the Swedish public liked "If I Were Sorry" enough to vote it as a winner. So why didn't the whole of Sweden get behind their entry? Perhaps they saw the result as a foregone conclusion anyway? I guess we'll never know. 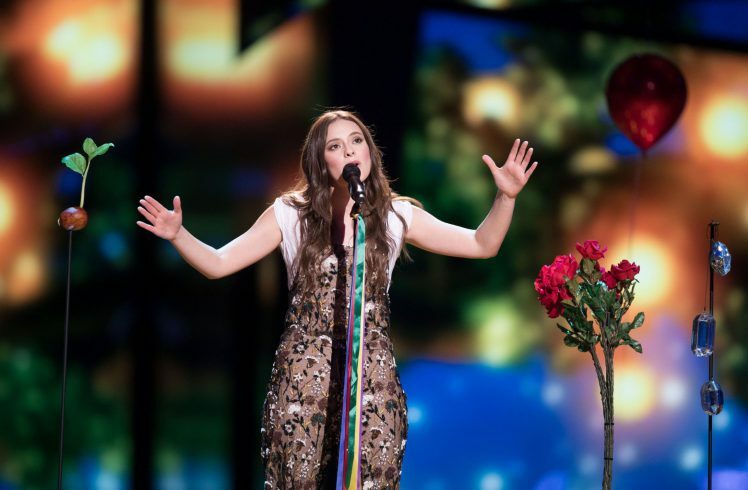 It would be fair to say that "If I Were Sorry" has not been welcomed by a large section of the Eurovision fan community, who expect Sweden to send a different type of song, sung by a different type of singer. But it is 2016, and love or hate it, Sweden has sent something very contemporary and I'm predicting a definite top 10 result. And I'm not sorry, no. Peter and Ola also performed a smashing uptempo pop song called "Sing Me Out" in the interval act, which for me was much better than many of the songs in this year's Melodifestivalen - The Ark may be gone but this sounded like the great lost Ark song, with its pounding and dramatic chorus and finale. The other big interval act this week was Hasse Andersson, perhaps in recognition that he qualified from Andra Chansen last year. He also showed up this year's entries, many of which are just too calculating and cynical and lacking the warmth and fun of "Guld och gröna skögar"
I used to hate Andra Chansen because of the repetition of the songs in the duel/knockout format but the current format is much better: 4 duels, with the winner of each duel earning a place in the final. "Håll om mig hårt" - Panetoz vs "Hunger" - Molly Pettersson Hammar. Ha! I got great pleasure from this result. No offence to Molly, but her over-singing of this non-song just irritated me. Panetoz on the other hand brought fun and energy and absolutely deserved that place in the final. Oh, and they retweeted one of my Twitter comments so I will probably love them forever! 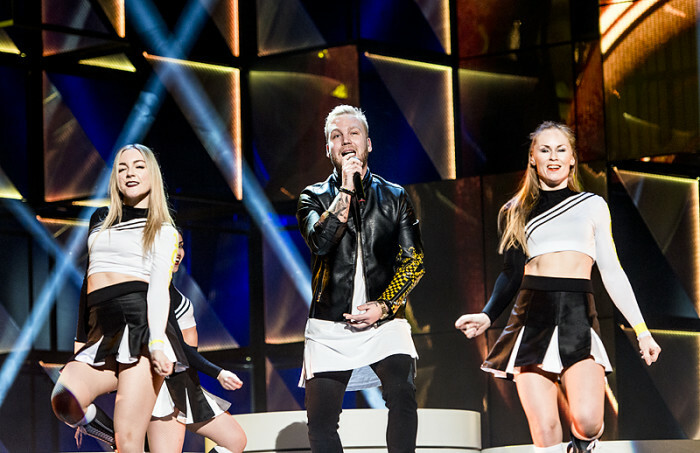 This song also received the most votes of any in Andra Chansen this year. "Rik" - Albin and Mattias vs "Put Your Love On Me" - Boris René. There was only one song I wanted to win this duel - and sorry Albin and Mattias, but it wasn't yours. Maybe I would love Rik more if it wasn't such a shameless re-write of Din Soldat. I like them though, and would hope that either or both of them would return in future with a better song. "I Will Wait" - Isa vs "Kizunguzungu" - SaRaha. The most closely-fought of the duels, with not much of a margin between the winner and loser. The voters made the right decision, sending a catchy and fun song - which has gone on to be a big radio hit in Sweden - over a disappointing ballad which would just have got lost in the final anyway. "Rollercoaster" - Dolly Style vs "Bada Nakna" - Samir and Viktor. An unsurprising win for the darlings of Swedish tabloid-land, making a splash on stage. Just like last year, they qualified from AC to the final. But novelties wear very thin very quickly, as S and V were about to find out in the final. As for Dolly Style, I just wonder if this is it for them, or will they return to a future Melfest in yet another incarnation of the group? So the final line-up was known, and Friends Arena prepared for the big showdown. Who would get to represent Sweden as defending champion in this year's ESC? Melodifestivalen headed to the home of this wonderful creature! 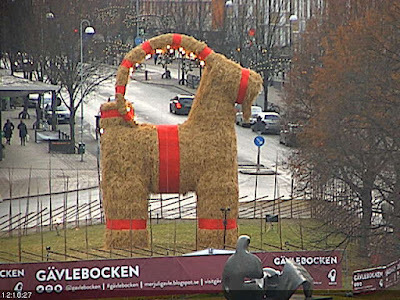 Of course the Christmas goat was long gone by February and the town was the centre of attention for a different reason. Week 4, a.k.a. "the one with the winner" also had a good reason to watch, as the week's co-presenter was none other than the mighty Sarah Dawn Finer. She and Gina kicked the show off in style with a Swedish re-write of Guy Sebastian's "Tonight Again". There was also a very emotional interval act with a number called "Hela Sveriges Sång" with Gina singing in Arabic, Sarah singing in Hebrew and special guest Jon Henrik Fjällgren doing what he does best, a bit of jojk. But what of this week's entries? The general expectation before this year's contest was that it had Molly Sandén's name on it, and it was no surprise when she was awarded the mythical "pimp slot" in the final heat. But before even hearing the song, I was majorly cringing over the title - "Youniverse" (oh FFS!) And by the time Molly finally performed the song, I cringed again. Ridiculous staging - check! Stupid hand-choreography - check! And what a disappointing song - check! Don't get me wrong. I like Molly. She's had some good hit singles, she is talented, gorgeous and a great role model for young women. Oh, and she is also one half of Swedish pop's golden couple - the other being Danny Saucedo, who co-wrote this song with Molly. Now I get the sentiment, but the end result was just disappointment. A bit like Melodifestivalen 2016 (with very few exceptions). Molly did make it to the final; but she was about to be eclipsed by a teenager making his Melfest debut. Panetoz have their critics in the fan community, but I was glad to see them back again. I previously described them as a Swedish version of Magic System (the Ivory Coast band who have enjoyed a long and successful career in France) and this year they brought another variation of their successful formula of Swedish and African upbeat pop fusion. Dolly Style put the Sugababes to shame when it comes to line-up changes. Despite the songwriting pedigree (G:son/Boström) I wasn't sure if there was enough life left in the novelty for it to match the appreciation of the now-iconic "Hello Hi" among the fandom. Unfortunately these days Melfest is so watered-down and generic that even the songs described as "rock" are a long way from that. Every rock song in Melfest is automatically compared by me to "1000 Miles" and "Runaways"fell well short of that standard. I doubt very much if either Martin Stenmarck or Linda Bengtzing will think about returning to Melfest. Times have changed and these are dark times for singers who are either older or from a time when schlager still ruled in the contest. For me though, one thing unites Martin, Linda, and the Tommy-Patrik-Uno trio from week 2: the songs just weren't good enough. And even though Mr Björkman claims that it's no longer about schlager or songs but it's about the whole picture, the fact remains that a well-performed good song will take you a lot further than the forgettable songs which these artists delivered this year. And in any case, why does Björkman/SVT allow these artists to enter if the songs are falling short of expectations? Or is there a more sinister explanation - allow substandard entries which subsequently do badly, which in turn will then deter schlager/older artists from entering future contests? Unfortunately SVT's usually reliable web stream kept breaking down and as I also had other stuff going on that evening, I therefore had to watch later on catch-up. It appears that SVT had finally got the memo about annoying musical-style numbers, so tfor this week's interval acts we were treated to a stand-up routine by co-host Henrik Schyffert and Gina showing off her contemporary dance skills. It was the second time (or technically third time if you count him backing Behrang Miri) in Melfest for Oscar Zia. Like Isa, he came back with a ballad; but "Human" was in a different class from "I Will Wait" and its simple but dramatic staging was impressive. So it was no surprise to see him reach the final. The other finalist tonight was Idol winner Lisa Ajax with yet another ridiculously-titled song: "My Heart Wants Me Dead". Ridiculous staging too, with all that toilet roll hanging from the ceiling. I must admit that at the time of Melodifestivalen I couldn't stand this song but it later grew on me. I had a problem with its similarity to Zara Larsson's "Uncover". Not an obvious similarity, but a similarity nonetheless. "Put Your Love On Me" - Boris Rene. So let me get this right - Boris is a singing footballer? What is it with Sweden and singing footballers? (Hello, Kevin Walker!). In a year where virtually none of the Melfest songs had any immediate impact on me, along came Boris with this ridiculously catchy radio-friendly pop song. Just one gripe: is my heart in a little box, or a litter box, or a letter box?? Just before you start to scream 'cultural appropriation', SaRaha grew up in Tanzania and has recorded some very catchy pop in Swahili so there is a lot of authenticity here. Yes it is very similar to "Waka Waka" but for once I'll allow a bit of plagiat. Extremely infectious Afropop and refreshingly different at Melodifestivalen. Sara Larsson (that's her real name, not to be confused with Zara Larsson!) co-wrote this with Arash. "Weight of the World" - Smilo. "You Carved Your Name" - Swingfly feat Helena Gutarra. "Kom ut som en stjärna" - After Dark. Swingfly's song was a shock non-qualifier for me - I thought it would sneak an AC place at least, going by the songwriting pedigree (Jocke Åhlund, Andreas Kleerup). But maybe it was just because the song just wasn't as good as "Me and My Drum", the whole thing lacked the charm of that previous success and the staging was a little on the amateur side. So, by week 3 of Melodifestivalen, the plug was pulled from the schlager life support machine and the time of death was declared. But After Dark gave it a fabulous feathery costume-changing key-changing send-off. Looking back now, week 3 was my favourite heat in this year's contest: better songs and finally a glimmer of hope that there would be some songs I would enjoy, and play, long after the contest was over. Another week, another "skandal". Charlotte Perrelli was due to be Gina's co-presenter this week, but had to take a much lesser role due to conflict of interest as she is also appearing in an ad campaign. Wiktoria - a new name getting some promotion in the fabled "pimp slot". However, the use of light projections onto clothing is now getting a bit old. Time for some new gimmicks eh? Meanwhile David Lindgren - or should that be "Lind-groan" as that was the reaction from many of the fans - mad his big comeback with a stupid song title, lots of lasers and oodles of plagiat. The similarity of this to "Sun is Shining" nearly had me falling off my chair. Prior to this heat, two of last year's returnees were tipped to qualify to the final. But Isa and Molly Pettersson Hammar had to settle for a spot in Andra Chansen. IMHO, Isa made a big mistake coming back so soon with a ballad. She should have returned with another uptempo song in a different style from "Shake It Off" oops I meant "Don't Stop", then missed a year, then returned with a ballad. The staging of "I Will Wait" was just too dark, it wasn't much of a song and all in all it was a missed opportunity. With a large number of songs in this year's selection, the Debs-and-Anton are in danger of becoming the next Freddie Kempe and spreading themselves too thinly. There should be a rule in all song contests, not just Melfest, that a songwriter or songwriting team should only be allowed one entry. As for Molly, victim of the app-skandal of 2015, she came back with "Hunger" what for me was an intensely irritating song, a repetitive scream-fest, the kind of song which the fanboys lap up. Yes we know she can sing, but there is just something missing here. There seems to be a lack of sincerity, it's all very cold and clinical, and I just didn't - and still don't - like this song at all. In another time and another place Krista (pictured above) could be the next schlager queen-in-waiting, but with schlager apparently on its last legs, that post remains vacant. I quite liked this though and I don't think we've seen the last of her in a song contest. As for "100%" by Victor och Natten, well I thought that was a nice catchy song which deserved to do better. It was the type of song I could see Albin and Mattias doing. These are not good times for the "oldies" at Melodifestivalen. Hasse Andersson bucked the trend last year, but what's the point of having the combined talents of three of Swedish pop's 'elder statesmen' Patrik Isaksson, Tommy Nilsson and Uno Svenningsson enter to go and spoil it all with a snoozeworthy toilet-break song like "Håll mitt hjärta hårt"? Conclusion: a disappointing week in a so-far disappointing year at Melfest. Would week 3 be any better? Back in November, after weeks of rumours and revelations, when SVT revealed its line-up of songs and artists for Melodifestivalen 2016, my immediate thoughts were - "it's deja vu all over again"; an incredibly high number of returning artists and very little in the way of surprises. Although some artists in recent years have used Melodifestivalen for the sole purpose of promoting new material and reaching out to a wider audience, rather than focusing on the actual competition element, Melfest has become a "bubble" for a number of Swedish artists. You're a big fish in a small pond - you may not enjoy any kind of commercial success outwith that bubble, but inside the bubble there's the name-recognition among the Swedish and international Melfest fan community, and one one more chance to wow that TV and internet audience with your latest song. But in these days of fleeting fame and the throwaway nature of listening to music it's unlikely that a Melfest appearance would be the launchpad for career longevity. My other thought when I saw the line up was that returning artists = diminishing returns. Coming back for a second/third time, you can bet that the song will never be as good as the first one. So I wasn't building up my hopes too highly for Ace Wilder, Isa, Oscar Zia, Panetoz, Molly Pettersson Hammar, Swingfly, Pernilla Andersson or Dolly Style, all "second-timers" at the contest and most of whom, it could be argued, have not really enjoyed any significant success since their Melfest participation - I exclude Samir and Viktor from this list though, as they followed up "Groupie" with "Saxof*****gfon" which was also a big hit in Sweden, and they (or at least Samir anyway) never seem to be too far from the Swedish tabloids. In a previous post from last summer http://europecrazy.blogspot.co.uk/2015/09/summer-rewind-2015-allsang-remains.html I had predicted Dinah Nah, Ida Lafontaine, David Lindgren and Bruno Mitsogiannis to make an appearance in this year's line-up. Of these artists I thought Dinah was the most likely to make a quick reappearance - I definitely think we'll see her back at some point. As well as returning artists, there was a returning main presenter too: Gina Dirawi, accompanied by a different co-host every week. Gina's co-host was none other than soon-to-be-returning ESC host Petra Mede, and she completely stole the show. 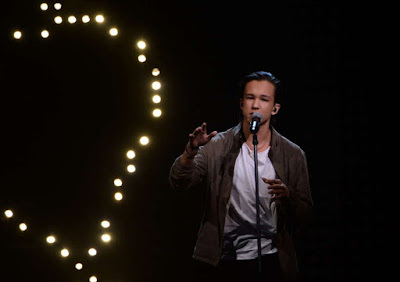 Something else stole the show in week 1 - well, there's nothing like a good old schlager-skandal to keep Melodifestivalen in the headlines and the first week delivered that. 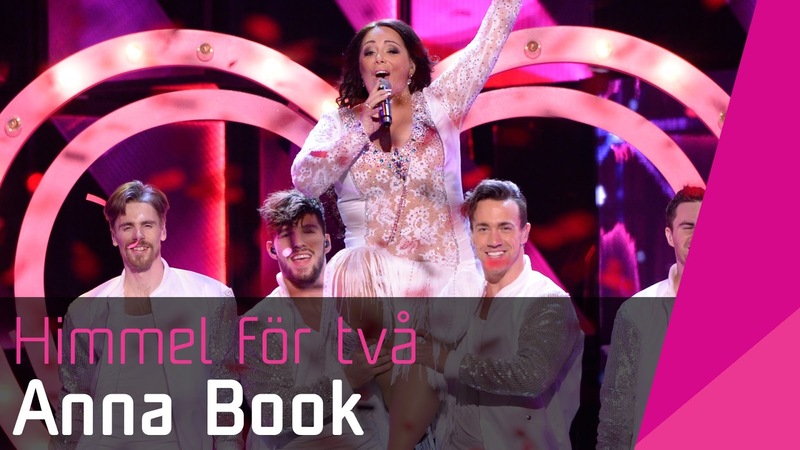 Anna Book would have been celebrating the 30th anniversary of her debut appearance at Melodifestivalen in 1986 with "ABC", by returning with a song called "Himmel för två", with lyrics by the very successful Swedish author Camilla Läckberg. That was until the clips of week 1's songs went online, and it was quickly spotted that "Himmel för två" was not as original a song as first thought. For the tune had a past life: it was previously been submitted to the 2014 Moldovan contest and sung by a Moldovan singer Felicia Dunaf. Although the song didn't progress beyond the early stages of the contest, it found its way online. So "Himmel för två" was disqualified immediately. Poor Anna was completely left in the dark and didn't know anything about the song's past life as "Taking Care of A Broken Heart". Needless to say she was devastated, but SVT did the decent thing and allowed Anna to perform her song as interval act in week 1. IMHO I prefer Felicia's English language version of the song to Anna's version, and I don't think "Himmel..." would have qualified to either the final or to Andra Chansen. The other interval act in week 1 also took us back to 2002: none other than Las Ketchup with "Asereje" which I will always remember as the big holiday hit from our summer holiday in France that year. A music contest or....a musical? I've had this major gripe over recent years about Melfest and what it really wants to be. A song contest? A comedy/sketch show? Or....a musical? Melfest 2016 opened with a song by Gina and Petra - "Hela Sveriges Fest" and by the time that was over, we were onto the convoluted introduction which seems to get longer with every passing year, and the time-wasting, padding and repetition gets more tiring by the year. But I guess that Melodifestivalen (and a number of other national finals) and indeed the Eurovision Song Contest semi-finals and final have been affected by what I call the "X Factorisation" of TV. Repeats, recaps, repeats of recaps, 'coming soon'/'previously on...' etc. There was one very funny sketch in this year's Melfest though: the running gag of "proper" Swedish acting talent, giving some almost Shakespearian renditions of Melfest lyrics. Week 1 gave us "Groupie" as interpreted by Stina Ekblad; subsequent weeks would see the likes of Krister Henriksson, Lena Endre and Mikael Nyqvist (all familiar faces to us Nordic Noir fans) bringing some gravitas to Melfest golden oldies by Kikki, Bettan and Lotta, Linda Bengtzing and Timoteij. Yes, it appeared very quickly that Melfest 2016 was going to be a "sounds like" contest. But I would agree with week 1's finalists: although "Don't Worry" was no "Busy Doin' Nothin'" the staging, choreography and production values were streets ahead. As for "Constellation Prize", I'd previously written it off as a song with a ridiculously stupid title. (Indeed, there were many songs in this year's Melfest with ridiculously stupid titles). But then Robin took to the stage and all was forgiven. The simple but effective lighting - either that or I want the name of the detergent Robin washes his shirts with! - was just perfect; and Robin himself was just perfect too. Readers of this blog may remember that I loved "Din Soldat" so much that it was my favourite song of 2014. So much was expected of "Rik" but all I felt was disappointment; this was basically, "right guys... we want another song which sounds just like the big hit!" in other words, an inferior soundalike. A big shock as Samir and Viktor were expected to go direkt, but I was relieved that they didn't. They are now occupying that Sean Banan-sized slot in Melfest, you know the one - a novelty act with a huge fanbase, and inevitably denying a qualifying place to a more deserving artist/song. Yet I can't hate S and V - they bring some much-needed fun. but "Bada Nakna" was just too over-egged and if I'm honest, I preferred "Groupie"! With only 6 songs left in week 1's line-up, it was just a bit more embarrassing for the losers as only 2 were eliminated. I don't think Pernilla Andersson will be hurrying back to Melfest any time soon, although I could see Mimi Werner returning at some point, preferably with something more original than 2016's Jolene rip-off. By the end of week 1, all I felt was let down. Perhaps I need to lower my expectations of "Europe's biggest and best national final"?